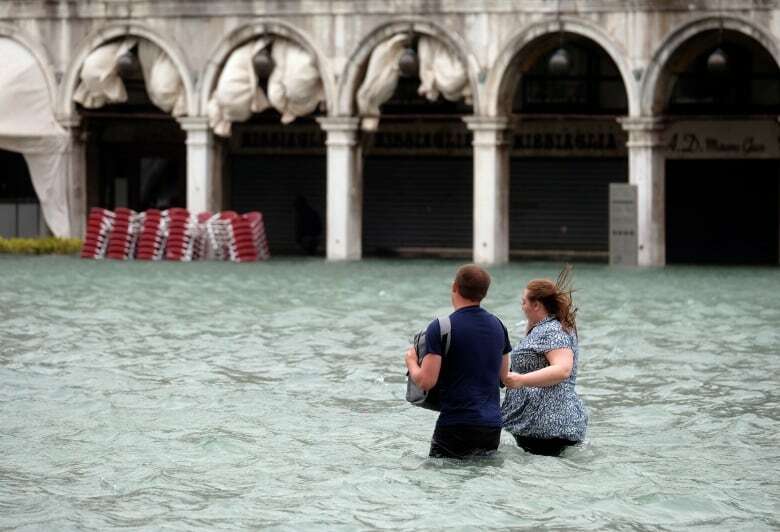 Venice was inundated by an exceptional high tide Monday, putting three-quarters of the famed Italian lagoon city under water as large swathes of the rest of Italy experienced flooding and heavy winds that toppled trees and other objects, killing six people. Tourists and residents alike donned high boots to navigate the streets of Venice after strong winds raised the water level 156 centimetres before receding. The water exceeded the raised walkways normally put out in flooded areas in Venice, forcing their removal. Transport officials closed the water bus system except to outlying islands because of the emergency. Brugnaro said he had asked to talk with Premier Giuseppe Conte to underline the urgency of the project, which would raise barriers when the tide reaches 109 centimetres. That happens, on average, four times a year in Venice. Much of Italy is under alert for flooding from heavy rains, a problem exacerbated by a lack of maintenance of the country’s many river beds. High winds toppled trees that killed passers-by in four incidents in Naples, Lazio and Liguria. Officials closed major tourist attractions in Rome, including the Colosseum and Roman Forum, early because of heavy rains. Veneto regional governor Luca Zaia says flooding this week could reach the levels of the 1966 flood that struck both Venice and Florence. The Interior Ministry urged officials in storm-struck regions, about half of the country, to consider closing schools and offices for a second day Tuesday.